New York Gov. Andrew Cuomo galvanized the higher education world when he announced Jan. 3 a plan to make the state’s colleges and universities tuition free. The plan would cover families who earn up to $125,000 per year and only full-time students would be eligible. The plan, called the Excelsior Scholarship, is to be phased in starting in fall 2017 and is expected to be fully implemented by the end of 2019. The estimated cost of the plan is $163 million and, pending legislative approval, the tuition-free initiative would be woven into the existing state and federal tuition aid programs. Cuomo emphasized that a college degree is as necessary in this century as a high school diploma was in the 20th century. Speaking from a site that used to house the Sunshine Biscuit Company, Cuomo said it used to be that you could get a job there, running a machine or driving a truck, and you would be just fine. “But those days are over. In this economy, you need a college education if you’re going to compete,” he said. Cuomo said there are 7.95 million jobs in New York and 70 percent of them require a college education. Cuomo invited Sen. Bernie Sanders to join him at LaGuardia Community College in Queens for the media event. Sanders campaigned on a free tuition plan in his bid for the Democratic Party’s nomination. His opponent, Hillary Clinton, had a slightly different plan during the primary that emphasized “debt-free” college education. After her primary victory, she adopted much of Sanders’ plan, and despite her defeat, the idea of tuition free college education remains popular. “The issue is that at a time we have a president-elect who thinks it is a great idea to give hundreds of billions of dollars in tax breaks to the top two-tenths of one percent. We have a better idea. 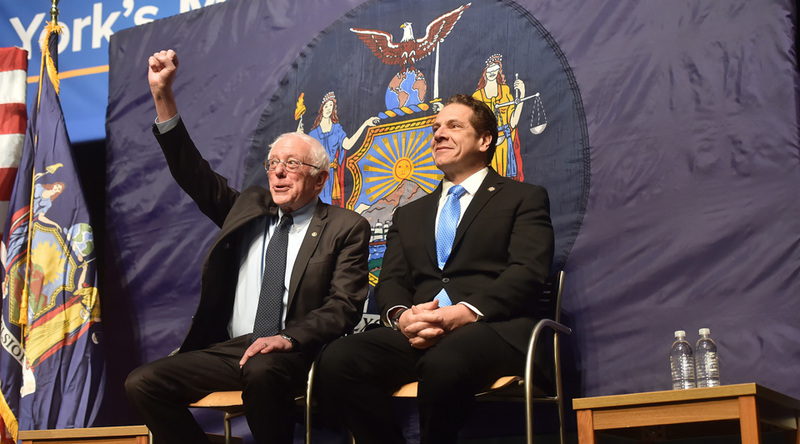 And that idea is to make public colleges and universities tuition free for every person in New York state, Vermont and in America,” Sanders said to loud cheers and applause. College administrators, faculty and students welcomed the governor’s proposal. 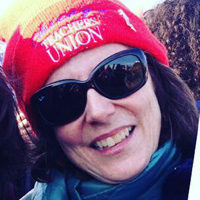 Calling it a “breakthrough” because “it names free tuition at public colleges as the new standard to which states should aspire,” Barbara Bowen, the president of the Professional Staff Congress– a union for staff and faculty at the City University of New York – said in a statement the union “echoes” Sanders’ support for the plan and will continue to work with the governor and state legislature to make “publicly funded free, high-quality college education” a reality. Bowen’s statement was tempered with the need to address long-term problems of disinvestment by the state and the toll it has taken on students and the entire higher education community. “At a moment when college costs are rising, student debt is out of control and Americans are wary of what the future holds, New York State can re-set the national agenda for college education by enacting a fully funded investment in free public college education for low- and middle-income students. Everyone in the state will benefit if college education is in reach for all,” she said, and then urged the governor to enable students to graduate within two or four years. She said an “equally visionary agenda” for investment in essential courses, student support services and other academic resources is badly needed to meet the graduation goals. United University Professions President Frederick Kowal said the Excelsior Scholarship proposal is “the kind of positive, progressive change that UUP’s members would get behind.” The UUP represents faculty at the State University of New York. But Kowal also worried about overall funding for higher education coming from the state and the federal government with the new Trump administration and the president-elect’s proposed education secretary, Betsy DeVos, a billionaire who has campaigned vigorously for privatizing public schools. “The only thing we know about Donald Trump and higher education is that he agreed to pay $25 million to settle lawsuits alleging Trump scammed students enrolled at his deceptively named Trump University,” said Kowal. Kowal said the governor’s free tuition proposal must also provide necessary funding for SUNY to hire more full-time faculty, expand programs, and make up for draconian state cuts during the Great Recession. Pointing to the presidential ambitions that Cuomo is said to have, Kowal said a holistic approach to funding public education would go far in helping the governor establish himself as a viable alternative to the extremist policies embraced by the incoming Trump administration. Media reported that CUNY New York Board of Trustees Chair William Thompson, SUNY’s chairman, H. Carl McCall, and chancellor, Nancy Zimpher, voiced support in statements focused on affordability. SUNY Student Assembly President Marc Cohen called on New York legislators to act quickly to approve Cuomo’s proposal. State Republicans expressed tentative support for the plan. CUNY Rising Alliance, described as a New York City-based coalition of groups from various constituencies including campus-based unions, issued a statement saying it “applauds” the governor for his proposal. Correction: This article has been updated to reflect the correct location for LaGuardia Community College, which is Queens.